Details of these properties can be found in any standard inorganic textbook. Because of the diversity in organic compounds (they range from acetone in nail polish remover and ethyl alcohol in whisky to complex macromolecules like proteins and nucleic acids which are in comparison monster molecules ), it is absolutely imperative to understand in considerable depth how organic molecules react. Understanding the mechanistic profile of different classes of such molecules will not only help us make useful small molecules which can fight cancer, but also help us understand why a certain protein folds in a certain way to develop the cancer in the first place. This may seem a daunting task but surprisingly mechanistic organic chemistry is pretty well developed. A large family of molecules react in the exact same way in similar conditions so several generalisations and rules have been formulated to predict the reactions accurately. So as it rests even a beginner with a basic understanding of structure, reactivity and mechanism can confidently say that he knows the chemical mechanism by which DNA is replicated! The ground state electronic configuration of carbon is 1s2, 2s2, 2p2. So with 4 valence shell electrons it is expected to form 4 bonds. But as we can see the bonds formed by the s orbitals will not be the same as those formed by the p orbitals for the simple reason that their shapes are so different. So for the reaction of C with 4 Hs to form CH4, we would have the following bonds: C(s)-H(s), C(s)-H(s), C(p)-H(s), C(p)-H(s). Thus we would have two directional bonds (C(p)-H(s)) and two non-directional bonds (C(s)-H(s)). (Remember s orbitals are spherical and spheres don’t point to any specific direction and p orbitals have pointy lobes pointing towards x, y or z directions). Also the strengths of the bonds would be different: it would be easier to break the C(p)-H(s) bond than C(s)-H(s) as s orbitals have better electronic overlap. But in reality all the bonds of CH4 are identical. So we have a problem. To solve this, the concept of hybridization has been used, which is quite popular as it easily explains a lot of bonding but even before we start talking about it it’s useful to know that it is an artificial concept which we have created not necessarily something which actually happens in nature. The concept of hybridization has been shown pictorially in figure 1. 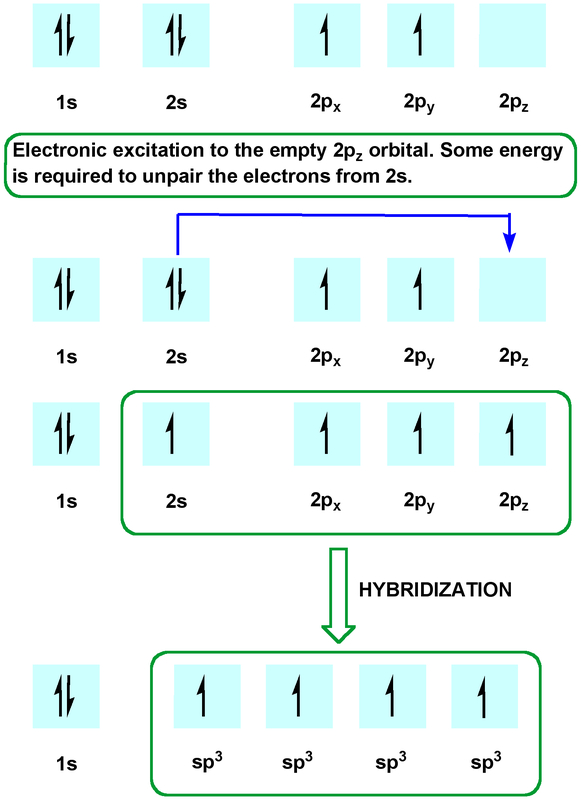 In the example three p and one s orbitals mixed or hybridized to give 4 identical sp3 hybrid orbitals. Similar treatment would give rise to sp2 and sp hybridizations, only differences being in sp2 only two p orbitals are used , which means one electron in the third p remains unhybridized and there are two such unhybridized p orbitals in case of sp hybridization. It is encouraged that the reader tries to follow the shown approach and perform the hybridization themselves. Also from the VSEPR theory1 (see any standard inorganic chemistry textbook), it is known that sp2 and sp hybridized molecules are planar (sp2 hybridized molecules are trigonal planar and sp hybridized molecules are linear considering three and two groups attached to the central atom respectively), whereas sp3 centres adopt tetrahedral geometry, which is basically to minimize the energies of the molecules. The angle between each group in case of a tetrahedral geometry is 109.50, 1200 in case of sp2 and 1800 for sp hybridized molecules. So methane which has an sp3 carbon is tetrahedral which is indeed what is observed in nature and ethene (CH2=CH2) and acetylene (C2H2) with sp2 and sp carbons respectively are planar. Now a quick look into the nature of bonding in these molecules before the topic is closed. 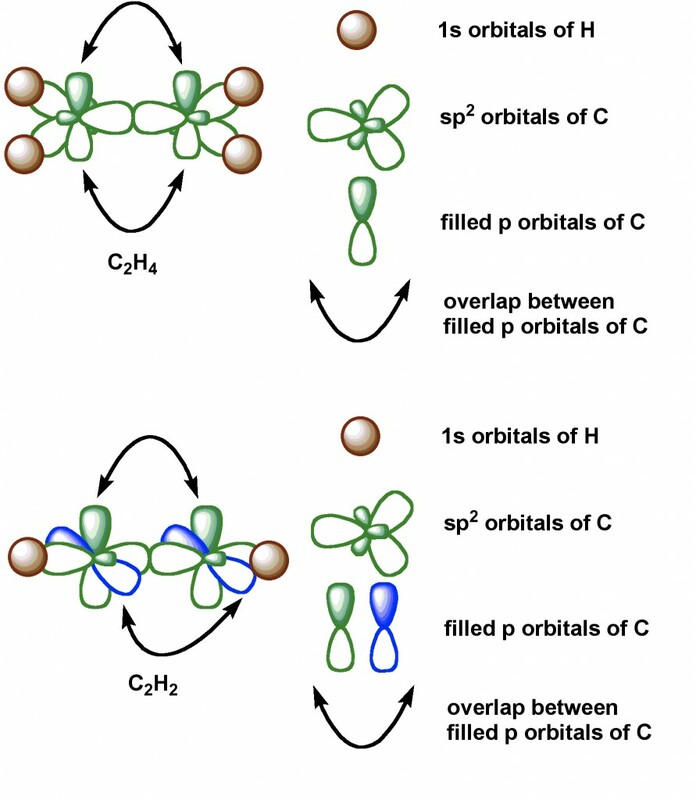 Since sp2 and sp Cs have unhybridized p orbitals with an electron in each and the p orbitals are perpendicular to the plane of the molecule (remember p orbitals are always perpendicular to each other as well), in say ethene the two unhybridized p orbitals from each sp2 C overlap with each other to form a pi bond. So what we know as a double bond in ethene is actually a combination of a sigma (single) bond between two sp2 orbitals of two Cs and a pi bond between the p orbitals on each C. This is illustrated by the figure 3 below.